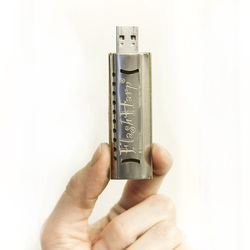 But buy a FlashHarp® and you'll find it offers something more that no other flash drive can... It replaces the vacuous vibe of ordinary drives with the soulful, freewheelin' feelin' that musicians get carrying their ax to a gig! Even more, FlashHarp's data-storage capability breaks the spell of the harmonica's high 'n mighty tone, which can be so intimidating it causes many beginners to quit. This puts the harmonica back on "nothin' special" ground ("Hey, it's just my flash drive, what do you expect?!") so you're free to play from a more relaxed place—a sort of hi-tech, "hobo campground" where no one judges you. • TO CONTINUE CARRYING AND PLAYING IT! • TO NOT PUT IT IN THE BACK OF A DRAWER! • TO FALL IN LOVE WITH THE GENUINE, BONAFIDE ARTICLE! The 3" FlashHarp is a great-sounding little instrument! Its "guts" include brass reeds and reed plates and a plastic "comb" (preferred by most players today). I make each one by hand using stainless steel covers that are cut with custom-made tools. I carefully combine the memory and musical workings—both from market leaders—so that each is undisturbed by the other. The lesson video is my finishing touch on a digital device with a hobo soul. 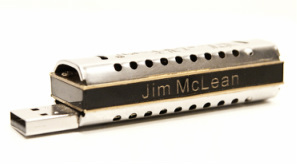 And even if you stop playing the harmonica for a while—hey, it happens—you can still put FlashHarp to lots of use. I call this "having a Plan ⒷⒷ." FlashHarp just makes more sense than harmonicas that just make music! The Lesson-Loaded FlashHarp now SHIPS FREE! Order FlashHarp with my homespun, "Five Basic Steps to Playing" video and I'll ship your FlashHarp to you at no cost! Contact me to add Personalization ($20 extra) to your FlashHarp order, or, to turn it into a Necklace ($13 extra).